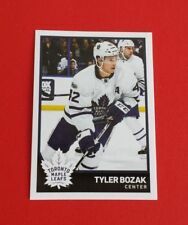 2010-11 CERTIFIED TYLER BOZAK RED POTENTIAL CARD. CARD NUMBER IS #16. To CANADA. EFFECTIVE April 19, 2014. Card in title is the actual card you are purchasing. Larger Sets-Vary by weight. Player: Tyler Bozak. Team: Toronto Maple Leafs. Set: 2010-11 Limited Threads. Year: 2010. Item Condition: Near Mint/Mint. SetType: Insert. Manufacturer: Panini Group. Sport: Hockey. Player: Tyler Bozak. Set: 2010-11 Zenith Yours Truly Autographs. Year: 2010. Manufacturer: Panini Group. Attributes: Autograph. Team: Toronto Maple Leafs.